We are trusted experts throughout Broward, Palm Beach, Martin, and Indian River Counties. From small, residential entryways, in a large pool and patio area, or Saltillo in a kitchen and dining area to Mexican tile installed in a large resort courtyard or terracotta floors in a commercial building, no job is too big or too small. Click here to view stunning images and read about one of our terra cotta stripping jobs. 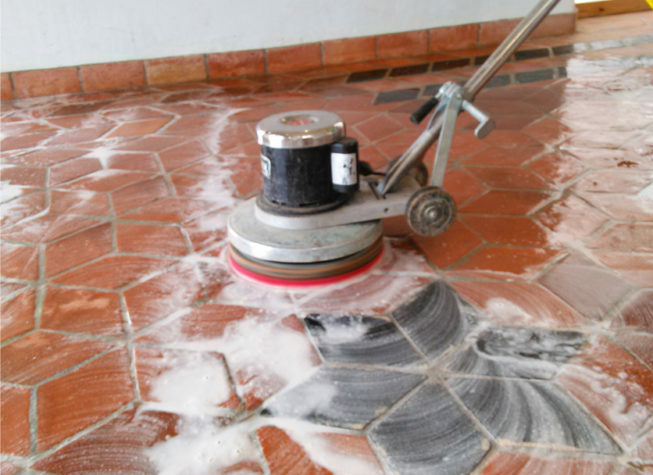 At Godoy Stoneworks and Tile Care, we can instruct you on the proper day-to-day care of your tile floors, countertops, and other surfaces. We offer a free, downloadable Care Guide and can recommend Care Products to help you keep your home or business looking great. We also provide a regularly scheduled maintenance program, upon request. For a FREE estimate on clay tile stripping and cleaning services in Broward, Palm Beach, Martin, and Indian River Counties, fill out our online contact form or call (561) 502-0692 or (561) 797-9592 today.